Right now we have car colors as a purely aesthetic choice. they make no impact on the car price or attractiveness, or the time to paint, or anything like that. 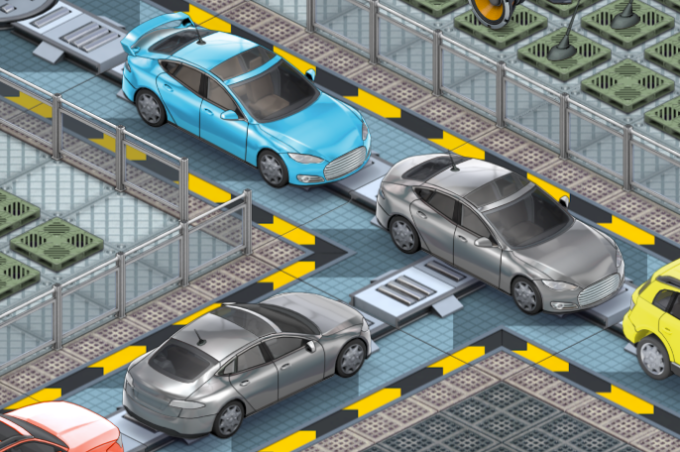 In practice, car colors can be set per-model (if the player chooses to), in order to make it clearer which are which on the production line. This is very helpful. Because I like this feature, I don’t think I want to start introducing different prices or demands for colors. The only exception to this system is ‘polished paintwork’, which sticks the car through an extra slot, makes the car more attractive to buyers, and also changes the rendering effect so the cars paint looks much brighter, which is pretty cool. To add to everyone’s confusion, I also have a mechanic where certain car colors are LOCKED and unselect-able until the relevant achievement is beaten and unlocked, which I thought was a nice way to incentivise aiming to beat the achievements in the game. 1) Leave it as shown above. it has a special button which enables Chrome, and selecting any other color will disable it. Selecting chrome means all other colors get removed, and now your car is chrome. Yay! Simple(ish) to understand surely? 2) Make chrome paint a feature, that has to be researched (yay! more design research!) in the design studio. Its then something that gets selected like ‘Polished Paintwork’ (probably make a new paint category for this), and can be a premium feature. I could have a new upgrade for the paint shops that does this, making those cars take longer. 3) Make it just another color (like 1) but also require an achievement to unlock it anyway. We already have a UI to show color options as locked/unlocked so I can re-use that. As I type this out I am aware that I am leaning towards 2). I want more reasons to keep the design studios around, and to be honest this would be a good point to move that ‘polished paintwork’ stuff into the design studio anyway? 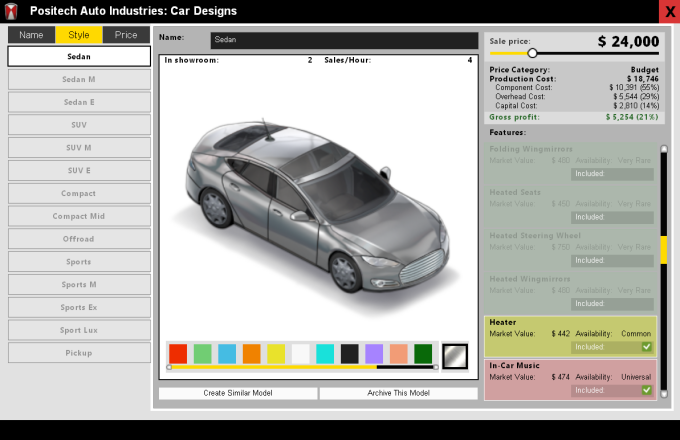 I can see a new design category on the design screen like I have for wheels, and power-train, that has ‘Standard paint / Polished paint / chrome’ as 3 different options. This keeps things working within existing game mechanics and should be easy to understand right?